The thin icing on top doesn’t overwhelm where sweetness is concerned. They’re the perfect on-the-go breakfast with a cup of coffee, or part of a larger holiday breakfast or brunch spread. 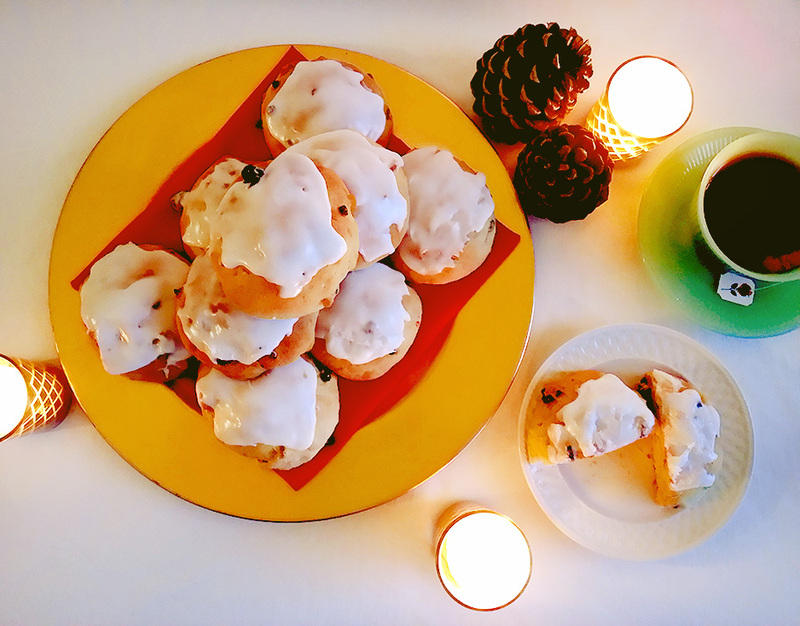 With a little planning, you can be eating fresh marzipan stollen buns tomorrow morning! What are you waiting for? In a measuring cup, measure the milk. Warm in the microwave on high power for about 1 minute. Stir the milk, adding a bit more time if it doesn’t feel warm to the touch. Stir in the yeast along with 1 tablespoon of the sugar, and let sit until the surface is very foamy, stirring occasionally to help dissolve the yeast. In the bowl of a stand mixer, place the rest of the sugar, flour, and salt. With the paddle attachment, mix on low speed until combined, about 30 seconds. Add the butter and let mix on low speed for 1 – 1 1/2 minutes. The mixture should look dry and crumbly. Add the eggs, along with the foamy yeast mixture, and switch the paddle for the dough hook. Mix on speed 2-3 with the dough hook until a sticky dough forms, about a minute and a half. Scrape the bottom and sides of the bowl to incorporate any stray dry ingredients, and mix on speed 5 for 30 seconds. Add the fruit and almonds, mixing for a total of 1 minute, gradually increasing speed from speed 1 to speed 4. Grease a large bowl and scoop the dough into the bowl. Cover with plastic and let rise in a warm place for 1 hour. After 1 hour, punch down the dough and fold it over itself a few times in the bowl. Preheat the oven to 400 degrees. Prepare two sheet pans with parchment paper and set them aside. Portion the marzipan into 22 – 1 inch balls (0.4 ounces each by weight). Divide the dough into 22 pieces (3 ounces each by weight). Flatten the portions of dough into discs and place a ball of marzipan in the center of each one. Fold up the dough over and around the marzipan, being sure to pinch the seam end very well to seal. Place the buns seam-side down on the parchment paper-lined pans. Let them sit uncovered to rise again for 1 hour. Bake the rolls in the preheated 400 degree oven for 10 minutes. Turn the temperature down to 325 degrees and continue to bake the buns for an additional 15 minutes. When the buns are done, they should be light golden brown, feel hollow when tapped, and feel light for their size. To make the glaze: In a medium sized bowl, stir together the powdered sugar and milk until a thick icing forms. Let the buns cool for about 10 minutes, then spoon about a tablespoon of icing onto each of the warm buns. Smooth the icing over the tops with the back of a spoon. The stollen buns are best stored in an airtight container at room temperature for short-term storage, or in the fridge for longer storage. Before serving, pop into a warm oven for 5 minutes, or for a few seconds in the microwave until they’re heated through. Serve with a cup of coffee or hot tea! The perfect light wintry breakfast. Now this is some fruit-filled bread I can get behind. Just sweet enough, with lots of citrus and almond flavor, they’re now my favorite cold-weather speedy breakfast treat!